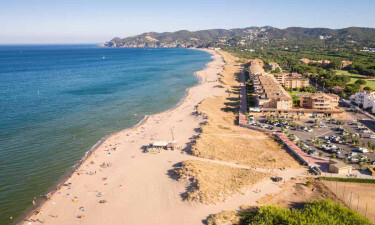 The Costa Brava region of Spain is known for its agreeable temperatures and a handful of the best beaches in Europe. The luxury camping site of Playa Brava is nestled within the heart of this area and offers countless amenities for those looking for peace and relaxation. 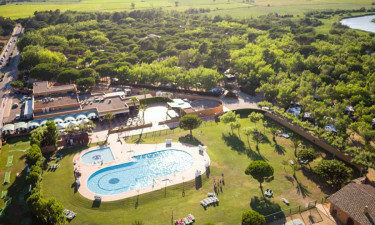 As this resort is located inside the vast Montgrí-Baix Ter nature preserve, visitors will be able to enjoy natural beauty alongside the modern conveniences that have come to define luxury camping. Please speak with a LUX-camp representative to learn more details. Why should I camp at Playa Brava? There are many instances when a camping holiday can be even made even more memorable by experiencing local cultures and natural attractions. Playa Brava offers numerous chances to appreciate what this region has in store. From hiking through nearby trails to visiting towns such as Begur, Palafrugell and L'Escala, there is always an adventure waiting just outside the resort. The botanical gardens of Cap Roig are another must-see sight during your stay here. The beaches along the Costa Brava coastline are known for their amazingly clean and clear waters. This is ideal for anyone who enjoys surfing, snorkelling, swimming and other aquatic activities. As this holiday camping site is found only moments away from the beach, maritime bliss is always a reality. 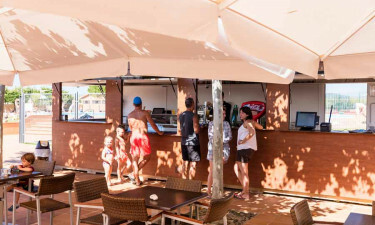 Whether arriving here to enjoy the waves or to relax underneath the Mediterranean sun, the luxury camping resort of Playa Brava aims to please. Guests can enjoy only the most convenient and modern facilities during their camping holiday. 5 different groups of onsite bathrooms are available and these are all equipped to handle disabled requirements. A laundrette with washing machines and dryers is also offered to all visitors. 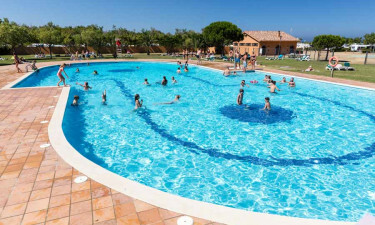 Other amenities include an information centre, a large open-air pool, free wireless Internet access within mobile homes and a playground for children. Catalan cuisine is unique and very healthy. An onsite restaurant is able to offer up some local dishes such as paella, pan con tomate (bread with tomatoes) and smoked Iberian ham. All of these meals can be enjoyed on an open-air terrace, and the bar within this restaurant is more than capable of quenching your thirst after a day at the beach. The sense of camping luxury at Playa Brava is further enhanced, thanks to the presence of a grocery store. Fresh fruits and vegetables, frozen foods, toiletries, camping supplies and souvenirs can be found here. International newspapers, books, magazines and tobacco are also available to all guests. This grocery store is open throughout the height of the tourist season.